Rakusan did not include the Fan Series in his main sequence numbering. Therefore, the original number used for each of the 36 Series prints has been modified to identify the Fan Series members of its theme. The five different fan silhouette shapes have been here assigned arbitrary numbers 1 through 5. To indicate a fan design these shape designations are added to the 36 Series number separated by a hyphen. 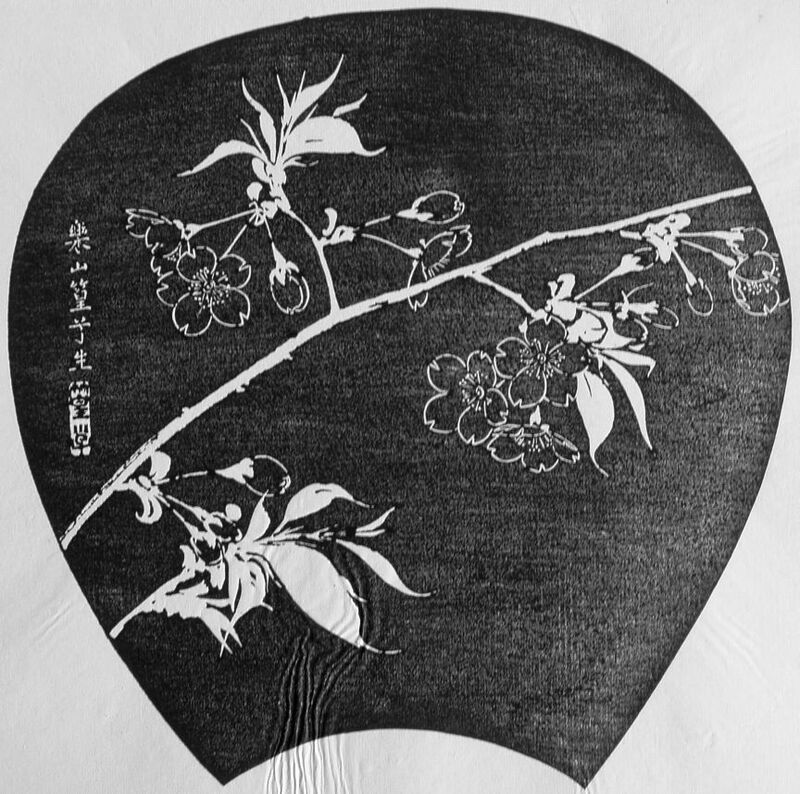 130-4 is the Fan Series design with fan shape 4 in the 130 Cherry theme. Like all other designs in this series, 130-4 was only produced in a single print run, and few copies are currently documented. Four of the five fan designs in this theme (including 130-4) and the 36 Series design 130 have seal C which indicates a carving date during the first half of 1934. Despite the early completion of most of its wooden blocks, Rakusan delayed printing and distribution of the prints in what became the 130 Cherry theme until the following year. It was eventually grouped with other spring season themes nearer to the end of the series. Use of seal B on 130-3 suggests it was carved somewhat later than the other designs. 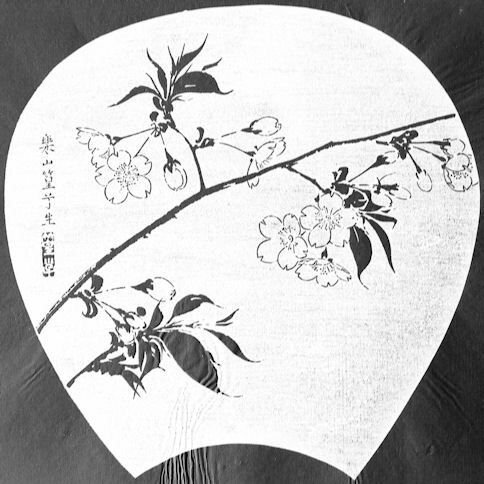 The composition of 130-4 includes a single flowering cherry branch. Most of the flowers are open, but a few are still in bud, and the leaves are beginning to emerge. 130-4 is rendered as a perfect negative version of the original sketch. In the original the flowers are light colored and the branches, stems, and leaves are dark. The ishizuri version is the exact opposite. In Japanese the general name for any cherry is 桜 (or older style 櫻), さくら, サクラ, sakura. As with many kinds of cultivated flowering cherry, the species identification is subject to taxonomic disagreement. In the West many varieties are often described as selections (or hybrids) of Japanese (Hill) Cherry, Prunus serrulata, a tall wild species with orange new foliage and smooth bark popularly called 山桜, やまざくら, ヤマザクラ, yama-zakura, lit. 'mountain cherry'. In Japan this wild cherry is sometimes identified as Prunus (Cerasus) jamazakura (with the species name taken from a European spelling of the Japanese name). The variety shown in 130-4 has a single rather than a double flower.